Do you think its fair to say that an Italian trattoria equals a US diner? No, I don’t think so either. But there is a certain sort of similarity: the menu is predictable, you have your favorite dishes, you always run into friends and neighbors there, and the waitresses are local and friendly. When we are in Italy, the Rustichello fits the bill when you want to eat a decent, reasonably priced meal. It’s a trattoria/pizzaria, down the hill from Montone, and right off of the E45 highway exit. At lunchtime it’s packed with workmen and truckers ordering full course lunches: maybe a plate of salumi, a pasta, a meat course and a coffee, with wine. They gather at long tables, every day, the same bunch of guys and enjoy themselves. Lunch is a big meal in Italy, and if these guys can’t get home for Mama’s cooking (and lord knows, half of them probably still live at home!) than they gather for a familial meal at the Rustichello. It’s always a pleasure to watch them; you get all the teasing, heckling, laughter, complaints, arguments, support that you would at any family gathering. Plus you can watch them flirt with the waitresses. 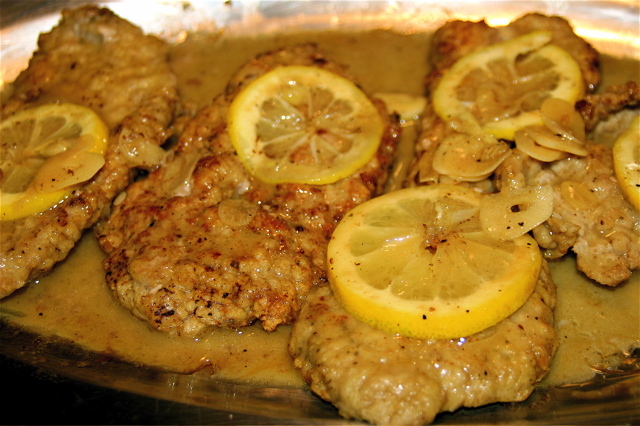 My favorite dish is the veal scallopine al limone. It’s extra lemony and the paper thin veal is peppery and delicious. We always order some of the cooked spinach, too. It comes in a round ball, and is a tangle of green, mushy goodness. The other night I was just missing the Rustichello, so I made some veal with a lemon sauce. The sauce was good, but the veal wasn’t quite right, too thick. I think that when you start craving a meal at the Rustichello, its time to head back for the real thing. Must be the spring weather….I’m also craving tender, young asparagus, little red artichokes, mountains of fava beans…..oh, the list is getting longer, and longer!